The buyer of the sandwich shop chain, JAB Holdings, also owns stakes in Krispy Kreme, Peet's, Au Bon Pain, and Panera Bread. 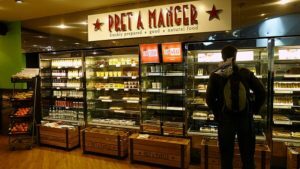 The United Kingdom-based sandwich shop Pret A Manger has been bought for $2 billion from investors led by the private equity firm Bridgepoint. The buyer is JAB Holdings, an investment fund of Germany’s Reimann family, which also owns Krispy Kreme. The deal is seen as part of a push by JAB to compete with Nestlé in the coffee sector. Nestlé recently signed a $7.15 billion licensing deal with Starbucks. JAB has accumulated what is reportedly the world’s second-largest coffee business in the last five years, with controlling stakes in Peet’s and Espresso House as well as Kenco and Douwe Egberts. It also owns bakery chains Au Bon Pain and Panera Bread. Schlee said Pret staff would get a bonus of £1,000 (about $1,300) when the deal is completed. 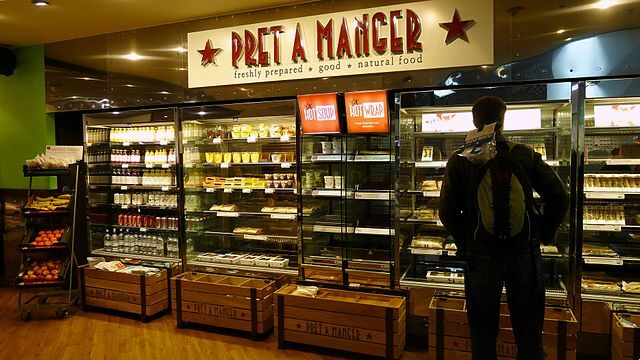 Pret operates 530 stores worldwide. It was started in London in 1986 by Julian Metcalfe and Sinclair Beecham, who are exiting the investment after 32 years. The company had revenue of about $1.16 billion last year. Bridgepoint bought the Pret chain in 2008.